Birding Is Fun! : Birds with "Blown Eyes"
Because I am a bird photographer I get to see and photograph our beautiful feathered friends, learn their habits and behaviors and sometimes I get to take a look at unusual conditions in the birds themselves. The Yellow-crowned Night Heron above exhibits what I and other bird photographers have come to call "blown eye". 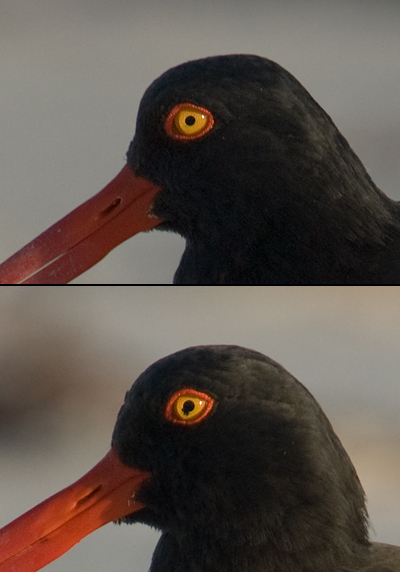 Both of the images are photos of the same bird and the right eye frame at the top is normal. The second image shows two tear drop shaped black blobs in the iris which is abnormal. I don't know if this was caused by an injury or if this might be a congenital condition. While I lived in Florida I often noticed "blown eyes" in American Oystercatchers and I have seen it where it was evident in both eyes of adult birds. The juvenile Oystercatchers have dark irises and it might be difficult to detect if their eyes are "blown" without getting images that are lit well and close up. These images are of two different birds that were a mated pair. I recently read about a congenital condition in humans called "iris colobomas" which is also found in other mammals and birds and have begun to wonder if that might not be the cause of the abnormal pupils I see in some species of birds instead of an injury to the eye. 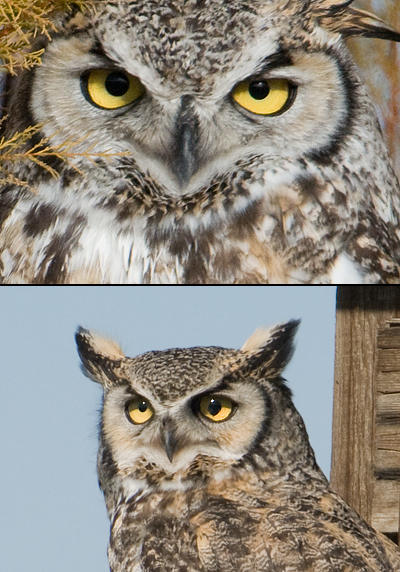 The top Great Horned Owl (photographed in Utah) in the composite above has normal eyes, the difference in the size of the pupils is caused by the angle of light dilating the pupils differently. The Great Horned Owl (photographed in Montana) shows a left "blown" eye. To me it looks like the pupil has leaked into the iris. I've seen this condition in the species I have shown in my images and I've also seen it occur in Bald Eagles. None of the birds I have photographed with blown eyes appear to have any difficulty seeing and it doesn't seem to limit their ability to stalk or hunt prey. 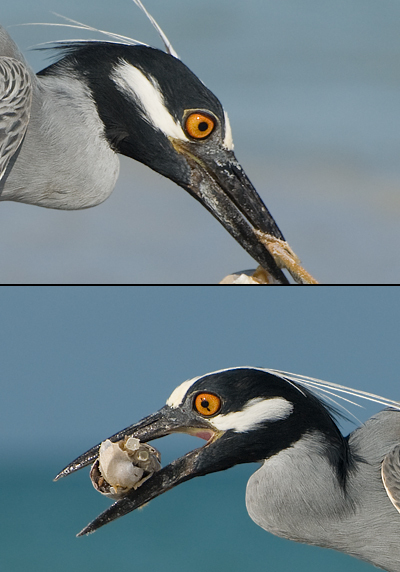 The Yellow-crowned Night Heron in the image above stalked, captured and ate three Ghost Crabs while I observed and photographed it. American Oystercatchers probe for their prey and none of the birds with blown eye that I observed exhibited any more difficulty in locating food than the adults nearby that did not have this condition. The Great Horned Owl with the blown eye was a male and the pair had three chicks and I am almost certain he had no difficulties providing food for them. I wonder how many other species exhibit "blown eyes" and what the cause is. Injury or Congenital Defect. I would love to read additional input on this topic so please feel free to comment. Fascinating post, Mia! I have never noticed "blown eye" in any of the birds I have seen before. I did not even know the condition existed until I read this post. Very interesting! All of your close-up photographs are excellent! I haven't even heard of this condition before. Cutting edge Mia! ...this is really interesting, Mia. I have seen it, but only rarely. I wondered if the bird was injured. I had not idea the condition had a name! Love the photos...and the info! First of all, let me tell you your photos are truly fantastic! You have raised an interesting subject, and I would love to have the answer too! I would not think injury is the cause since too many birds are involved. Only specialists could give a beginning of answer...! Well done and a subject worth looking for true answers! Thanks for all the comments on this post plus the kind words on my photography. Yesterday I was sent an image of a Great Egret from Melbourne, Australia that shows a blown eye too. I wonder how many species this can occur in. Truly fascinating as always, Mia, and fantastic images as well.